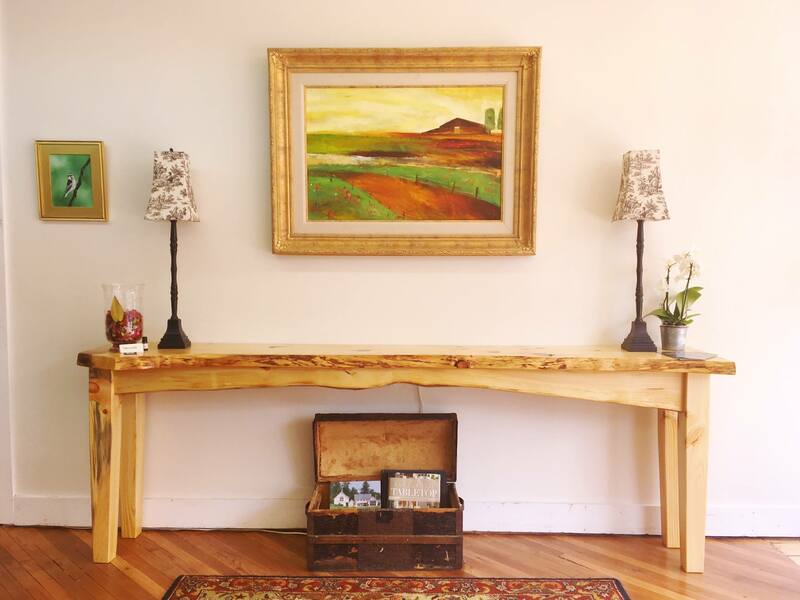 When Harris Clark and his wife, Courtney, moved to Waynesville from the NC coast in 2008, he was captivated not only by the pastoral landscapes and historic barns that dot the landscape in this area, but also with the furniture that is produced using the lumber from those same weathered buildings. "Whatever it is inside of me that makes me love the site of a century old farm nestled in a valley somewhere, is probably the same thing that makes me, like so many other people, so fascinated with the unique texture, color, and character of century old reclaimed barn wood." Although Harris was beginning his career as a firefighter at this point, he had a work history in residential construction and interior trim. He began searching for dilapidated barns that he could dismantle with the goal of furnishing his new home and owning a few pieces of furniture that they could not afford to buy. It wasn't long before friends and family started requesting similar pieces to be built. As the requests poured in, Harris quickly realized that it was difficult to find solid wood furniture of good construction, much less any that could be custom built, furthermore from reclaimed lumber. For that reason, Harris began building and selling these types of pieces and after eight years of building farm tables and other items in his backyard workshop between shifts at the fire department, both Courtney and Harris decided to go all in and open Farm Tables Etc. Both continue to work their fulltime jobs as a school teacher and a firefighter, but have equal passion for their custom furniture. Harris Clark identified his biggest challenge as navigating the legal and procedural aspects of creating a business. SCORE mentors worked with Harris to guide him step-by-step through the required steps to start a business starting with writing a business plan. "Being a business owner with plenty of experience in my trade, but not in actual business, SCORE helps me to fill the voids with expert advice from experienced mentors." Harris's greatest success so far has been to develop a pricing strategy that will sustain his business. "I was not confident enough to ask what the market was easily willing to pay for quality hand built custom furniture. My old prices were not sufficient to sustain the business long term, so getting my market dialed in with the help of SCORE and my prices raised to smart and fair numbers, I see a future that includes growth and success similar to what I originally hope for when setting out on this venture." "First and foremost, my SCORE mentor is open and friendly. This is important when you come into a meeting with multiple business people, all having experience in exactly what it is that you are having trouble with. This could be an intimidating situation, but all of the SCORE representatives I have met with were laid back, friendly and made me feel perfectly at ease. Next, she makes it clear that her purpose is to assist me with whatever business problems I have. I am always asked exactly what it is that I would like to get out of our meeting so that I do not leave still having unanswered questions. Lastly, she keeps me focused, always ending the meeting having me enumerate the actions that I am going to undertake as a result of our meeting."